Yesterday, as the wind blew and the snow swirled, I spent a good many hours planning our first garden. 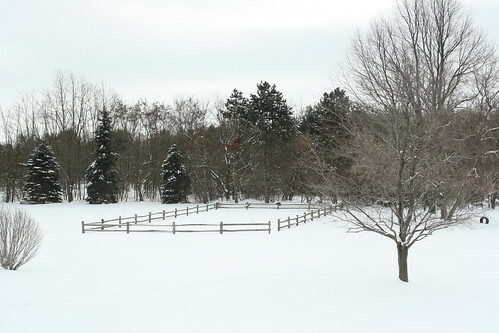 We’re fortunate to have a pretty large yard with a substantial area (40′ x 100′) already fenced off for gardening. even though it’s currently buried under a foot of snow (which I adore, it’s fabulous,) it’s time to start planning things for spring. Left entirely to my own devices, I would have created something monstrous, inefficient and unproductive – I haven’t done any gardening at all since I was but a wee lass eating peas off the vine in Mom and Dad’s garden. I needed help, and lots of it. I’ll be ordering from Southern Exposure Seed Exchange based on a friend’s recommendation and a casual look at their sustainable practices. Their catalog provides good descriptions of each seed variety, and their selection is quite extensive. Having seen the ravages of non-indigenous plant species decimating habitat(see Scots Broom and Himalayan Blackberry in the Pacific Northwest,) I focus on planting native species. Flowers and native plants will mostly be coming from Wild Type, a nursery just down the road specializing in plants found natively in this part of the state. Their primary business is native commercial landscaping, but they have a few days throughout the summer during which they’re open to the public. Last summer, I took home several flats of plants, including several species of sunflower that did very well, even in the limited growing time they had. We closed on the house in mid-July, and didn’t get fully moved in until nearly August – too late to do much with the garden, but at least some decorative and wildlife-feeding plants got in. There is still much flower/herb planning to go. 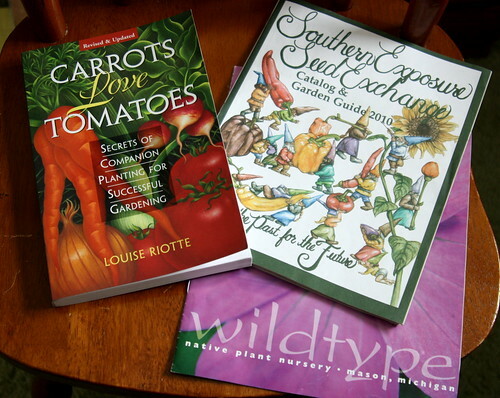 Carrots Love Tomatoes: Secrets of Companion Planting for Successful Gardening , by Louise Riotte, proved a valuable resource. Riotte lists an abundance of vegetables, fruits, herbs, flowers and trees along with their companion plants – plants that improve each other’s yield or protect each other from pests. She covers other basic aspects of the plants as well, including medicinal and poisonous plants. Thus, as I planned things out in growveg.com, I knew to put the allium and brassica families (onion and cabbage) together, to place pumpkins under sweet corn, beets with kohlrabi and so on and so forth. GrowVeg.com is a neat tool, and is free for 30 days. There is a garden planning/mapping tool, email alerts for planting/harvest and a planting guide. It’s not a perfect tool, but it’s not too bad. It would be very nice if the software (a Flash application used via a web browser) labeled each plant. If one wants labels, one must label everything tediously by hand (or be forced to memorize their key.) The ability to group plants into a single object would be lovely, as well; as it stands, if I decide to move one of those raised beds in the top left, I have to move every single element within it. That’s a hassle. Q. Is it really free to use the GrowVeg.com Garden Planning Tool? A. Yes, for 30 days you get the fully working version of our Garden Planning Tool. There is no limit to the number of garden plans you can produce and all the advanced features such as crop rotation are available. There is no obligation to subscribe at the end of your free trial and we do not require any financial details unless you decide to subscribe. Q. Why Should I subscribe if I can just sign up for the 30 days free trial? A one-year subscription is $25, $40 for two years. I haven’t signed up yet, and I’m not certain if I will. If they had more fully-developed features and a slightly more advanced user interface, I would be happy to do so. Looking down on this, I envision hundreds of pounds of fresh, organic, delicious produce providing us its bounty. I foresee learning how to can and properly freeze to get us through the winter months. I see myself driving baskets of produce to my dad and stepmom, to my friends and co-workers. It is a gratifying fantasy. What I’m not able to clearly envision is how many hours per week it’s going to take me to weed and maintain that gorgeous, yet relatively enormous for a first-timer, patch of land. There will be mulch, oh yes, and compost. Companion planting should help with insect and animal pests, but what about the weeds? There will be no herbicides. Ground cover? Perhaps. The Southern-most 25 feet I have currently planned to be covered in something like buckwheat. If I end up using the full 40′ x 100′, then amen and hallelujah, but I deem this unlikely. Whatever empty space there is will be a productive green manure crop. I’d pick clover, but one of our neighbors is on an anti-clover crusade, and I’d hate to a.) enrage her or b.) have her come over and spray the dickens out of it. So perhaps buckwheat, perhaps vetch; something to feed the bees. Certainly wildflowers. Next up, planning for the chickens! My dad had a similar sized garden when I was a kid. Before he retired, I can remember him coming home from work during the week in the summer and spending at least a couple hours outside in the garden, and pretty much all day Sat and Sun doing things like fertilizing, watering, weeding, etc. He had also set up a separate well and sprinkler system so he spent a good deal of time maintaining that too. Hi Erin, You will be pleased to know that we are just about to release a new version of the GrowVeg.com Garden Planner software that does automatically label everything and track varieties as well. Plus you’ll be able to add notes and organize succession planting. For bees and attracting benificial insects I would recommend phacelia which is also a good ground cover crop.